Excerpt from French Riviera and Its Artists: Art, Literature, Love, and Life on the Côte d’Azur – “THE WALLS SPEAK FOR ME”: Jean Cocteau and the Villa Santo-Sospir, by John Baxter. © John Baxter. Reproduced by permission of Museyon. All rights reserved. Subscribers, French Riviera and Its Artists: Art, Literature, Love, and Life on the Côte d’Azur by John Baxter bestselling author of The Most Beautiful Walk in the World, and We’ll Always Have Paris. Free book giveaway to two subscribers ends July 15, 2015. 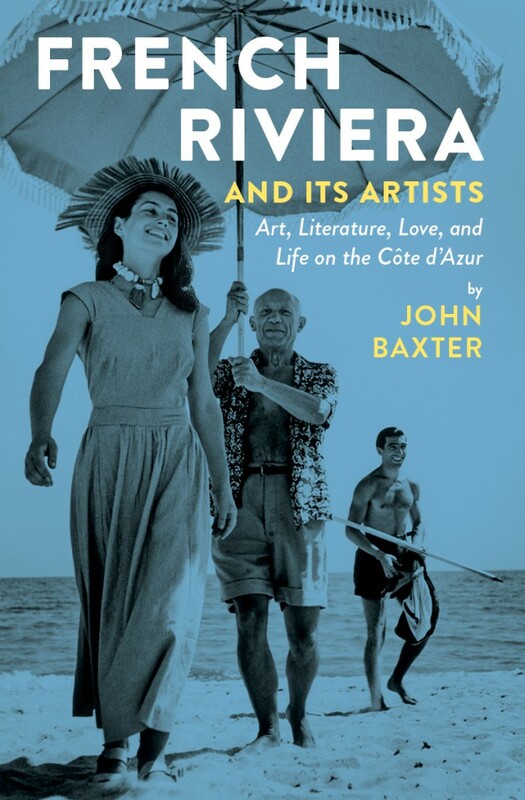 Interview: French Impressions: Author John Baxter and Editor Janice Battiste – conversations on the evolution of the book, “French Riviera and Its Artists” on A Woman’s Paris®. Nothing about Cocteau was conventional, least of all his childhood. His father committed suicide when he was nine. He was raised by his maternal grandparents and an often absent mother, whom he believed to be an actress, perennially on tour—until, at twenty, he recognized her in photographs taken in a womens’ prison. A kleptomaniac, she had been serving sentences for theft. As a child, Cocteau contracted what he called “the red and gold sickness”—a love of theater. It proved incurable. Everything he touched took on the quality of a performance, even his service during World War I. With crossdressing socialite and dilettante Etienne de Beaumont, he joined a private ambulance unit put together by socialite Misia Sert, friend of Marcel Proust and Erik Satie, and lover of Coco Chanel. To transport the wounded, Sert co-opted the delivery vans of couturiers Jean Patou and Paul Poiret, which were standing idle since the army drafted the design and tailoring staff to make uniforms. After leaving Sert’s comic-opera enterprise—“I realized I was enjoying myself too much,” he confessed—Cocteau responded to a challenge from Sergei Diaghilev to “Astonish me” by conceiving Parade (1917), a ballet set in a circus. He coaxed Satie into writing the music and persuaded Picasso to design it by turning up at his home dressed as a clown. He also wrote Le Train Bleu (1924) for Diaghilev, with costumes by Coco Chanel and décor again by Picasso. Turning to cinema, he directed the controversial short film Le Sang d’un Poète (The Blood of Poet, 1932) with money from Charles and Marie-Laure de Noailles. Once he began making feature films, La Belle et la Bête (Beauty and the Beast, 1946) and Orphée (Orpheus, 1950), both starring his lover Jean Marais, became instant classics. Attracted to athletic young working men, both as partners and models, Cocteau had been part of the group that waited in the wings of the Ballets Russe to sponge down a sweaty Nijinsky as he staggered off stage after a strenuous performance in such ballets as La Spectre de la Rose (1911). Later he rescued gay writer and habitual criminal Jean Genet from a potential life sentence by hiring one of France’s best defense counsels to fight his case. The same could be said of Cocteau, who was seldom found at his apartment in Paris’s Palais Royale, near that of his friend Colette. As winter came, he migrated south to the Riviera. An inveterate house guest, he was welcome in homes all along the Côte d’Azur and left his mark in most of them. Sometimes it was only a sketch scribbled in a guest book, but given even a little encouragement he would break out his brushes and dash off a mural. In 1950, money ran out midway through the filming of his novel Les Enfants Terribles. To raise more, director Jean-Pierre Melville suggested they find a wealthy patron with artistic pretensions on whom Cocteau could exercise his charm. The perfect choice, Francine Weisweiller, proved to be right under their noses, since they were already filming in her house, which was next door to the Paris mansion of Charles and Marie-Laure de Noailles on Place des États-Unis. The Brazilian-born wife of an American oil millionaire, Weisweiller was spoiled, beautiful, rich, well-connected, and flattered by the attention of the multi-talented Cocteau. In taking him under her wing, she also inflicted a subtle revenge on her husband for his long-standing affair with actress Simone Simon. Francine persuaded her spouse to invest in Les Enfants Terribles (1950), and invited the unit to continue filming in Villa Santo-Sospir, their summer home in St. Jean-Cap-Ferrat. When shooting ended, Cocteau stayed on in the villa, ostensibly to rest. It was to be his Riviera home for more than ten years. Cocteau repaid his debt to Weisweiller with art, creating tapestries, ceramics and mosaics for her homes. When she suggested the fireplace at Santo-Sospir needed brightening up, he surrounded it with a mural showing figures from Greek mythology. His two-dimensional style, something like cartooning—he called it “tattooing”—lent itself to wall painting, while his sexual inclination towards young sailors with Grecian profiles provided plenty of fuel for his imagination. The same year, Francine negotiated a deal with the town of Menton for Cocteau to decorate the salle des mariages in the town hall. Since he found the room “rather unsympathetic,” he decided, he explained, “to adapt the style of the turn of the century on the Riviera, with its villas, mostly now gone, interspersed with bunches of iris, seaweed and heads of waving hair.” Before he was done, he had not only painted the walls and ceiling but redesigned the furniture, the lamps, the curtains, and added some incongruous touches of his own, including a few panther-skin rugs. In his spare time, he also created a small museum in the Bastion, a seventeenth-century fort built into the town’s sea wall. Local pebbles made up a mosaic floor and the stone walls were hung with tapestries in medieval style. No matter how great the charm of a house guest, most eventually wear out their welcome. Cocteau’s relationship with Weisweiller soured in 1963, when she took a lover of whom he didn’t approve. Cocteau moved to Villefranche. Despite efforts by Jean Marais to repair their friendship, they were never reconciled. Before his death in 1963, Cocteau accepted one more mural project, but didn’t live to finish it. Financed by Nicoise banker Jean Martinon, the chapel of Notre Dame de Jérusalem in the hills above Fréjus was to have been the centerpiece of an artists’ colony. Cocteau planned the octagonal building with architect Jean Triquenot and executed some of the decoration, notably a Last Supper at which the apostles are portraits of Coco Chanel; Jean Marais; poet Max Jacob; novelist Raymond Radiguet, Cocteau’s one-time lover; Francine and Carole Weisweiller; and Cocteau himself. After his death, Édouard Dermit and ceramicist Roger Pelissier completed the decoration—poorly, in the general opinion. As neither Martinon, a freemason, nor Cocteau was conventionally Catholic, the chapel employs often obscure imagery, some of it related to the Crusades and the Order of the Knights and Dames of the Holy Sepulchre of Jérusalem. After her break with Cocteau, Francine Weisweiller, in poor health and with much of her fortune gone, became a recluse, barricaded like a sleeping beauty behind the umbrella pines and banks of crimson hibiscus that shielded the villa from the outside world. She died there in 2004. Four years later, it became a national monument. Cocteau is buried in the Paris satellite town of Milly-le-Roi but his spirit speaks to us from the walls of Santo-Sospir. 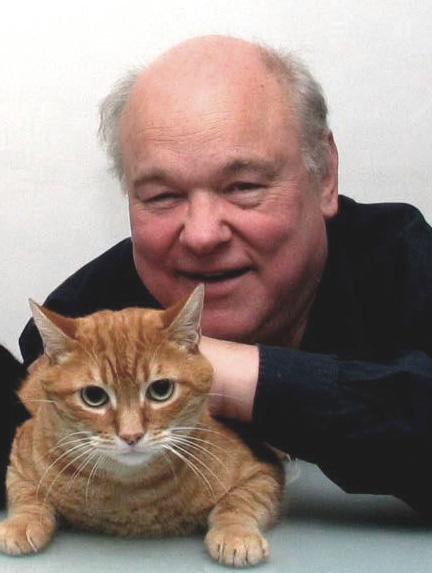 John Baxter is an acclaimed memoirist, film critic, and biographer. He is the author of the memoirs: The Most Beautiful Walk in the World, Immoveable Feast: A Paris Christmas, We’ll Always Have Paris, The Perfect Meal: In Search of the Lost Tastes of France, The Golden Moments of Paris: A Guide to the Paris of the 1920s, Paris at the End of the World: The City of Light During the Great War, 1914-1918, and Five Nights in Paris. A native of Australia, he currently lives with his wife and daughter in Paris—in the same building Sylvia Beach once called home. John Baxter’s “French Riviera and Its Artists” – “MANY FÊTES”: The Hôtel du Cap and Tender Is the Night (excerpt). “On the pleasant shore of the French Riviera, about half way between Marseille and the Italian border, stands a large, proud, rose-colored hotel. Deferential palms cool its flushed façade, and before it stretches a short dazzling beach. Lately it has become a summer resort of notable and fashionable people,” begins Scott Fitzgerald in his book Tender Is the Night, the finest of all Riviera novels, with this description of the Côte d’Azur’s most exclusive hotel. French Impressions: Author John Baxter and Editor Janice Battiste – conversations on the evolution of the book, “French Riviera and Its Artists”. “Writers interviewed by the media or at festivals often describe the crucial moment they decided to write a book,” writes John Baxter. “In my experience, such moments seldom exist.” John never set out to write a book about the French Riviera and its artists. The idea caome from a New York publisher, Akira Chiba, who owns a small company called Museyon. Akira handed editing of the book to a trusted collaborator, the free-lance editor Janice Battiste. Janice and John had worked with great congeniality on The Golden Moments of Paris, so it was a pleasure for them to set out again. The extracts from John and Janice’s emails synopsize the process by which they jointly brought The French Riviera and Its Artists to a successful conclusion. John Baxter’s “Five Nights in Paris” – a dazzling sensory tour of Paris’s greatest neighborhoods (excerpt). Acclaimed memoirist, film critic, and biographer, John Baxter’s Five Nights in Paris: After Dark in the City of Light is enriched by ancedotes from Baxter’s own life in France and written with the alluring, authoritative voice only he can provide. He is author of the memoirs: The Most Beautiful Walk in the World, Immoveable Feast, We’ll Always Have Paris, The Perfect Meal, The Golden Moments of Paris, and Paris at the End of the World. John Baxter’s “Paris at the End of the World” – Patriotism transforming fashion (excerpt). Preeminent writer on Paris, John Baxter brilliantly brings to life one of the most dramatic and fascinating periods in the city’s history. Uncovering a thrilling chapter in Paris’ history, John Baxter’s revelatory new book, Paris at the End of the World: The City of Light During the Great War, 1914-1918, shows how this extraordinary period was essential in forging the spirit of the city we love today. Travel Diaries: “To Catch a Thief” on the Côte d’Azur by Barbara Redmond who brings us a story of travellers who had come to the French Riviera, like her, to indulge in the sea and glitter by night. Reading until the professeur de natation was folding the last beach umbrella, then to dress for the evening. Travel Diaries: To the South of France with Love. Sara Horsley invites us into her world to share six weeks in Arles, France, during a study abroad program. There, she learned about the French culture and their respect and admiration of artistic expression. Readers’ Choice: 253 Good Books About France. Your quest is to dig below the surface, peek behind the façade, where lurks a story, rumor, recipe or fossil. We have an eagerness to explore fresh ideas, to forge powerful relationships and build a community. Readers, we invite you to draw close this narrative, woven on A Woman’s Paris, a narrative that has come to life, to discover secrets of the past and take part in shaping the future. Become a part of our conversation. We celebrate the art and ideas of people from every place and every heritage. Mireille Guiliano’s “Meet Paris Oyster” on the Parisians’ love for them (excerpt) – part one. Mireille Guiliano, a former chief executive at LVMH (Veuve Clicquot), is “the high priestess of French lady wisdom” (USA Today) and “ambassador of France and its art of living” (Le Figaro). She is the author of the #1 New York Times bestseller French Women Don’t Get Fat: The Secret of Eating for Pleasure, as well as French Women Don’t Get Facelifts. With her characteristic wit, wisdom, and storytelling flair, Mireille will soon have you wanting to eat oysters at least every week. Including a recipe for Oyster Vichyssoise. Leave a reply on "John Baxter’s “French Riviera and Its Artists” – “THE WALLS SPEAK FOR ME”: Jean Cocteau and the Villa Santo-Sospir (excerpt)"